Hop into our shop for $5 off a $30 purchase of Easterbasket candy, egg hunt treats and gifts for every-bunny on your list. Enjoy afree sample when you stop by! 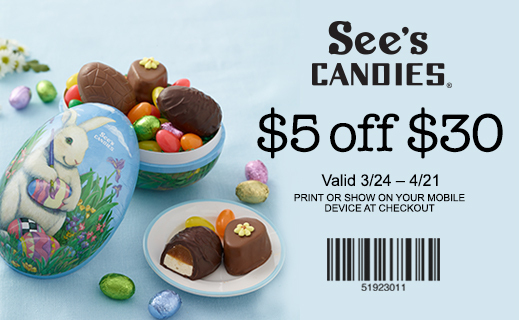 *Valid only at See’s Candies shops. Not validonline. Requires a minimum purchase of $30 (before tax). One coupon percustomer per day. Cannot be combined with other offers or discounts. Not validon past orders, gift cards or gift certificates. No cash value. All rightsreserved. Valid 3/24/19–4/21/19.